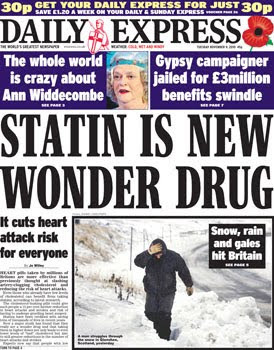 The Express's coverage of the effects of statins (like their weather reporting) has always lurched from one sensationalist extreme to the other. 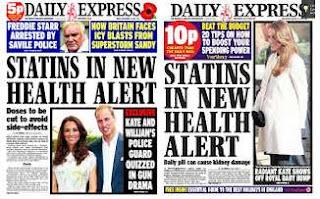 On other days, statins are subject to health alerts - they can be a risk to health, can raise your risk of diabetes and could cause agonising muscle problems, lung disorders and kidney damage. patients taking higher strength pills were more at risk of suffering acute kidney injury. staying physically active, sticking to a healthy weight, eating a health diet, maintaining good cholesterol levels, keeping blood pressure down, controlling blood sugar levels and not smoking. Latest research has found that following the simple steps and making small changes to daily routine are the key to a long and healthy life. 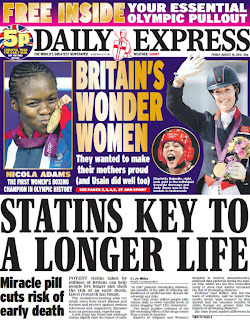 These seven steps were devised by the American Heart Association in 2010 - this research confirms, not entirely unexpectedly, that doing these things are good for you. Not smoking, regular exercise, not being overweight and eating a Mediterranean-style diet could 'substantially reduce' the risk of early death. 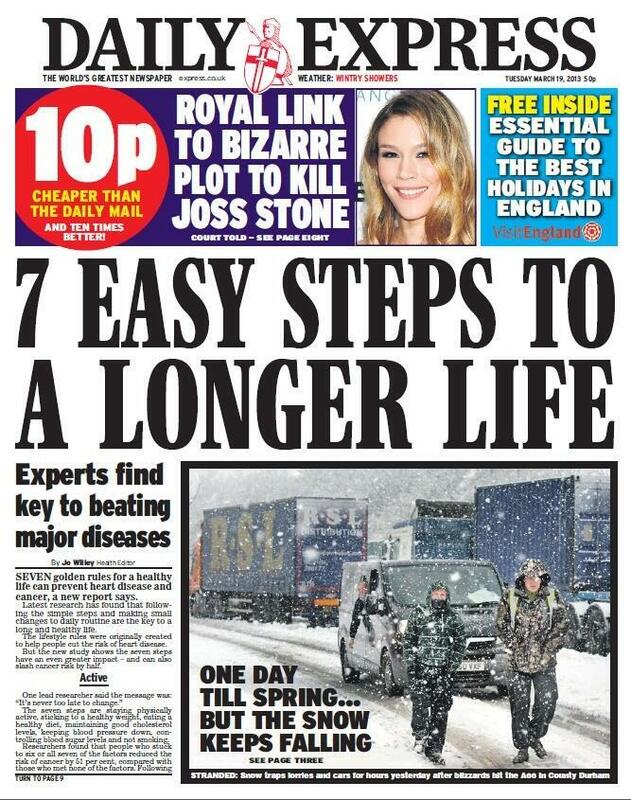 It does seem odd that the Express considers this front page news at all. 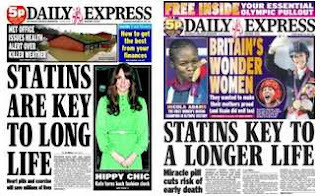 There were two big news stories on Monday - the political deal on future regulation of the press, and the Cyprus bailout. For such a strongly anti-EU paper as the Express, it's curious that they decided not to lead on events in Cyprus, and chose this instead. In Trevor Kavanagh’s column of 12 November, it was stated that Gordon Brown accused The Sun of blagging his son’s medical records. 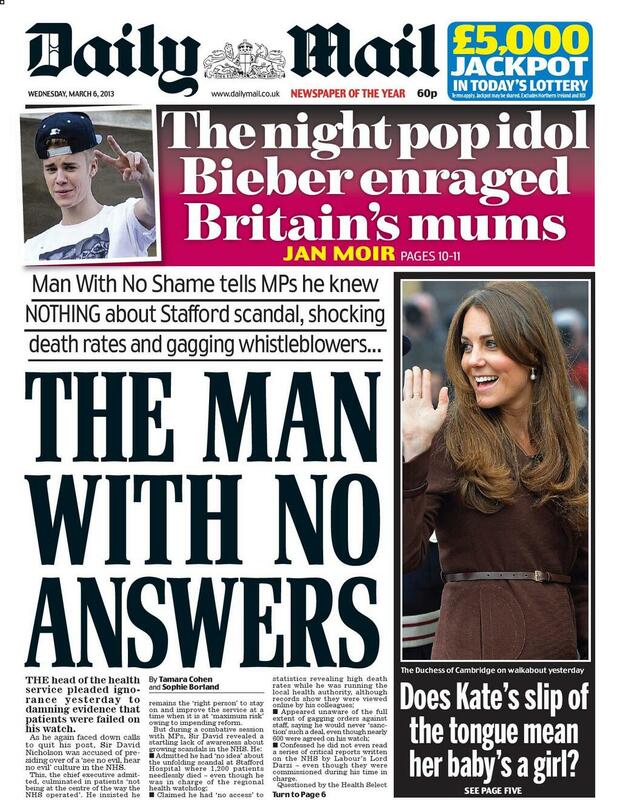 In fact, Mr Brown has never made such an accusation, in Parliament or otherwise. We were wrong to use this erroneous allegation as a basis to make comments about his character and integrity and to suggest that Mr Brown was ‘not telling the full story’. We withdraw these criticisms and apologise to Mr Brown. This is the fifth time that the paper has corrected claims about Brown in less than five months. Euro MPs want to brainwash children with “sinister” Soviet-style propaganda on a new website, it was claimed yesterday. European Parliament chiefs are considering setting up a site to target young children with a “playful” presentation of their working methods and democratic principles. "Political propaganda on vulnerable kids is a form of child abuse." 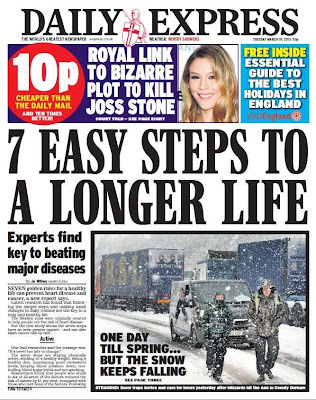 The Express's stance is reinforced by an editorial comment. 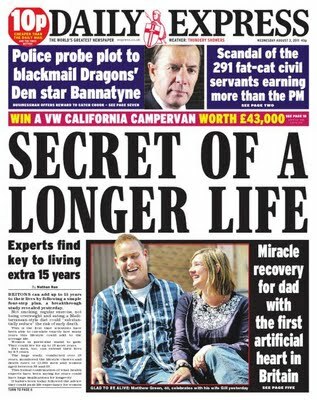 We do not normally find it worthwhile challenging Daily Express euromyths. It would be like trying to engage UFO Magazine in scientific debate: a waste of time and dangerous for one's mental health. Moreover, we are used and resigned to the peculiar phenomenon of its journalists switching off all critical faculties when it comes to taking politically motivated anti-EU tirades as fact, then working backwards to try to fit the circumstances to the 'crime'. But today's 'story' really does deserves a short comment. The paper, prompted by a complaint by a eurosceptic politician, published a piece arguing, entirely un-ironically, that creating a website informing young citizens and future voters of their rights is now to be considered propaganda. You heard right. The modern, Express-sanctioned meaning of propaganda - made worse by that one-size-fits-all criticism of "paid for by tax payers' money" - is not raging against a minority, say, or distorting the truth about which side is winning in a war, or inciting the populace to violence. Modern day propaganda is for a democratically elected Parliament to make people (including young people) aware of its existence and their rights within it. And to have the audacity to do so with the aid of that sinister, new-fangled technological wizardry: a website!!!! In fairness, an Express reporter had contacted this office and asked for a quote about how 'The Parliament' would justify its deeds. Never mind that an eloquent explanation of the purpose of the initiative (which is still only just that, a proposal being looked at) already appears in the document she herself had raised as 'proof' of this conspiracy to inform. We also happened to mention that, with one simple Google search, we had been able to come up with the UK Parliament's equivalent of this outrageous practice. Shocking, I know. Is there to be no end to the horror? 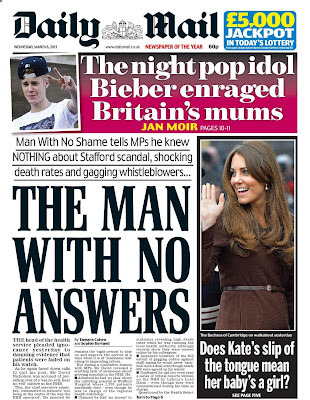 The reporter, to be perfectly fair, displayed immense fortitude at this juncture. She absorbed the ground-shifting discovery that propaganda was indeed alive and well at the heart of the Mother of Parliaments - never mind the barbarous EU - and then delivered this killer line: we should feel free to use this example in our own comment to her. Let me write this again. It was to be somehow our job to put the 'propaganda' slur in context by mentioning the existence of similar initiatives in most national parliaments including Britain's own. Providing context and balance in a story is no longer the job of the Daily Express reporter, you see. If you want balance and context you have to knit it yourself. You'd be searching in vain for this context in today's story, reader. You will not find it. What's worse, your ignorance of the existence of sinister educational websites set up by the Houses of Parliament leaves your children vulnerable to the horror of 'Soviet-style' British propaganda right here right now, under your very nose and, needless to say, with your taxes. 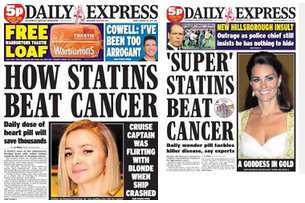 The Express did not include any response from the European Parliament in its article. 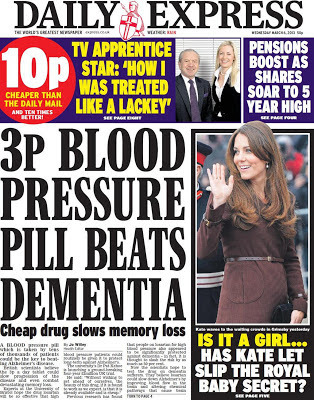 The headline on the online version of the article is slightly different: '3p pill cuts dementia risk by half'. 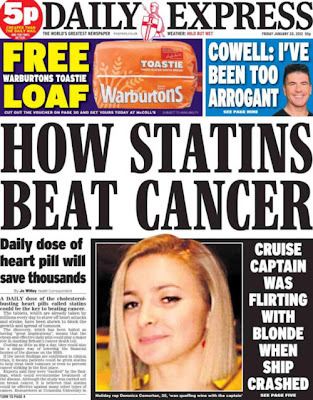 "While we certainly have an attractive drug candidate both from the point of view of possible effect and the low cost, we cannot get ahead of ourselves here or over simplify things - we still have to conduct the study to generate the proper evidence before we can make any claims as to how useful the drug will be." "Thank you, I will take that for my d...for my baby"
The same quote was used elsewhere. "Is this for us? Awww, thank you so much, it's [very] very sweet of you"
In other words: not much like what was originally reported. 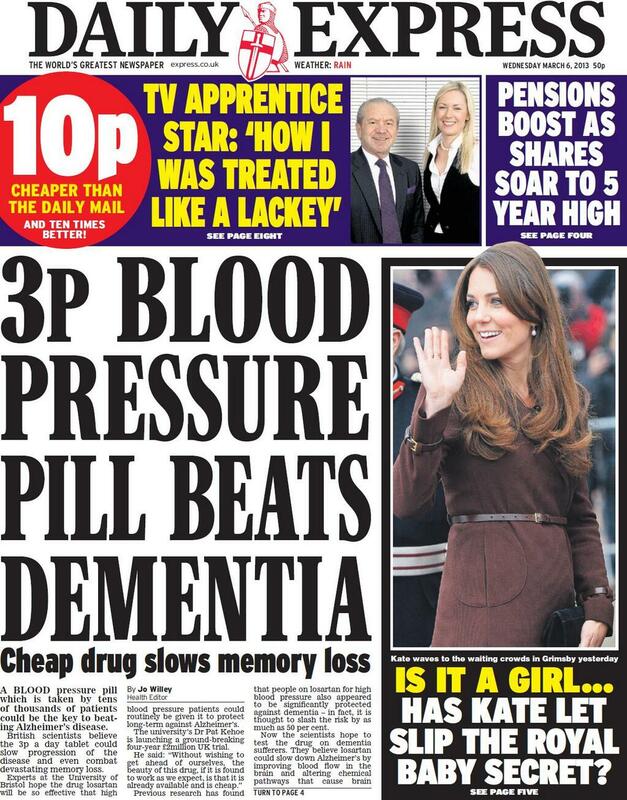 Curiously, this didn't make the front pages. 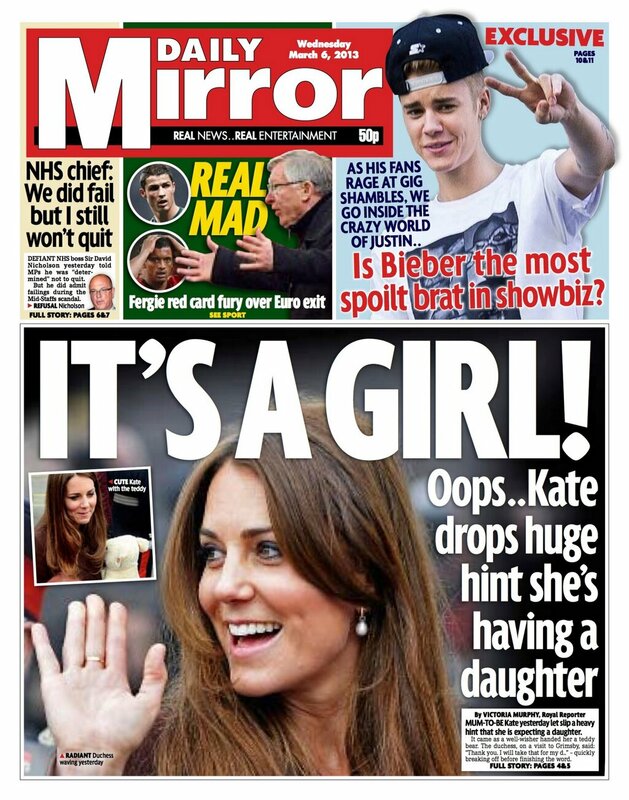 Meanwhile, in other 'pregnancy news', the Daily Star ran the headline 'Mystery of 'pregnant' star Cheryl Cole' on its front page on Saturday. Here's what happened: a pregnant woman went to see Cheryl Cole in concert. 'So nice to see lovely @CherylCole', she tweeted. Cheryl replied: 'Nice to see you too, you look amazing pregnant'. 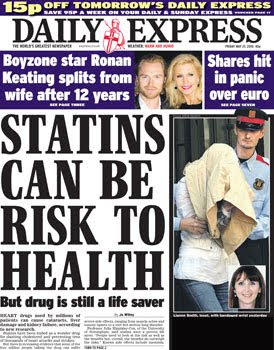 The 'mystery' is that anyone thought this meant Cheryl was pregnant, or that this was worthy of a place on the front page of a paper. Compare that with this letter, which challenged one of the Mail's incorrect EU stories and which they refused to print.